Gloriously sunny or gale force winds, the golf course and its 18 holes are always waiting for a round or two on the weekend whatever the weather. But whether you adorn shorts and t-shirts or multiple layers and a waterproof jacket (check out T3.com's round-up of golf waterproofs here) there’s one particular element of your golfing attire that, for the most part, remains the same. 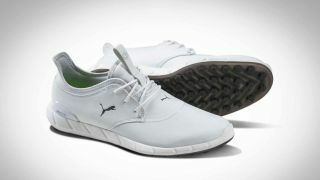 Yes, we’re talking about the trusty golf shoe- an item that has to blend style, sophistication and a technical ability. A shoe that allows for seamless transitioning between soft grass, gravel, sand, wet and dry surfaces and whatever else may come your way - perhaps an accidental swim in the pond. How about our round-up of the best golfing rangefinders? But in the market of golf shoes alone, there’s enough types to confuse those of even the lowest of handicap. From the more traditional spiked or cleated shoe that provide you with a firm grip to get the most out of the swinging arm, to golfing boots that supply seasonal winter protection with their wellington-eque waterproofing. Or… how about something completely alternative - the golfing sandal - yes, we’re not sure where they were going with that one either. Which brings us nicely onto a spikeless golf shoes- a relatively new contender to the golfing market, but one that has been designed to offer comfort and style and pro-level tech specs. While the rubber spikes offer slightly less stability than its spiked shoe sister, they offer more than enough grip in dry and damp conditions and provide ample comfort to those who suffer with foot and heel pain. Like any sports shoe, material matters and while some of us may not bat an eyelid at buying synthetics, others are leather lovers all the way. Quality, too, is key. For an avid golfer who completes 18 holes 3 times a week without fail, you should be looking to stretch the pockets a little to invest in a shoe that will last. Probably the best golf shoe for comfort, everything about the design has been purposely chosen and placed to bring you extra cushioning as you cover the ground on the golf course. Exceptionally soft leather is combined with an innovative sole design to offer a shoe that is both stable and heel-supportive- perfect if your feet start getting aggy by the time you reach the halfway tea hut. And don’t worry, this FootJoy Pro/SL does its fair share of waterproofing duty too, with a year’s warranty for reassurance. If you require a fantastically comfortable all-rounder, this mid-priced golfing shoe is certainly a safe investment. While the ‘eVent’ in the name of these shoes refers to their waterproofing technology, I think it would be understandable if we mistook it for a typo. Because, with their smart shiny leather toes, you could probably get away with wearing them to a back tie rather than a tee-off. Misunderstandings aside, this truly remarkable shoe really is the scratch golfer of the spikeless shoe world, combining comfort, class and excellent traction. From men’s day at the local club to the annual golfing tour, these shoes, like their design, require finesse and style on the course, rather than a half hearted sloppy walk around in the pouring rain. To the untrained eye, this stylish golf shoe looks no different to a guy-of-the-street kind of look, but get close, and you’ll see that Nike have sneakily inserted a load of technicalities to keep you at the top of your game. Take the traction for example - perfectly pressure mapped so you can take your swing slip free. Add to that a waterproof upper for when the weather turns and a cushy foam sole to keep you comfortable as you cover the miles and you have yourself an excellent shoe that seamlessly transitions from street to golf course. Sketchers have made a bit of a name for themselves as the brand that you can rely on for a comfortable shoe, and we can extend this courtesy to their golfing range too. Blending style with ultimate cushiness, Sketchers have packed in a whole host of their specially formulated materials to bring us a shoe that is completely unique and a cut above the rest. If you’re looking for a shoe that offers the same style street style as the Nike Course Classic but a little more on the comfort technicals, then this is the shoe for you. Some courses are unfortunate enough to be situated in some of the wettest parts of the UK and when you happen to be a member of one of these clubs, more often than not, only a wet weather shoe will do. While these shoes aren’t the most stylish on our list, they feature UA Storm Technology to ensure your feet remain bone-dry through the rain, wind and whatever weather the British Isles will decides to throw at you. Add to that, these shoes offer superior traction and support, making them a great all-round choice for wet winter golfing. Make sure you look and play the part on the course, check out T3.com's list of the best golf club sets for beginners and the best golf balls to master that hole in one.